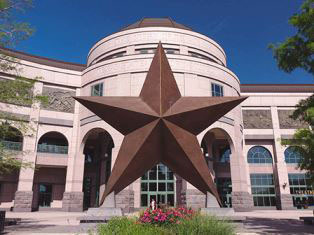 The Texas Capitol is more than an historic landmark; it serves as the seat of government for the state. 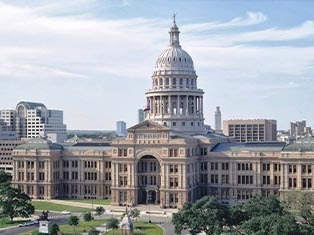 Due to the status, size and age of the building, the Capitol and Capitol Extension require constant attention. 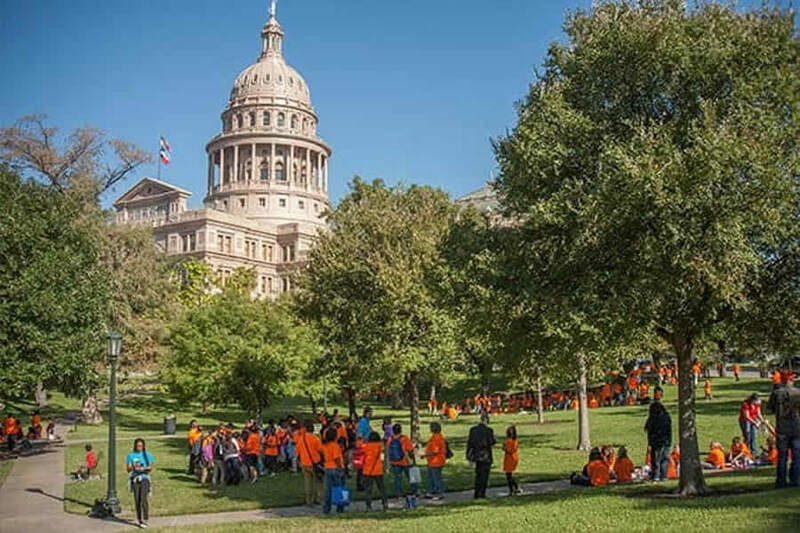 The dedicated and skilled staff of the State Preservation Board preserves and maintains the Capitol and Extension both for its current occupants and visitors as well as for future generations. Review current Bid Opportunities on the SPB Procurement Page. 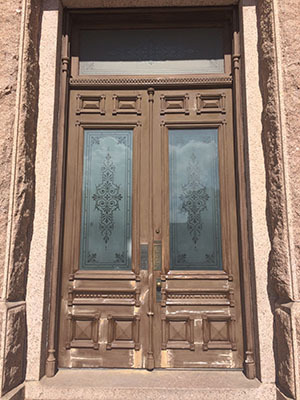 The exterior doors that greet visitors to the Capitol are original 1888 construction. In addition to facing sun, rain, and wind for the past 130 years, they are currently used by more than 1 million visitors per year. 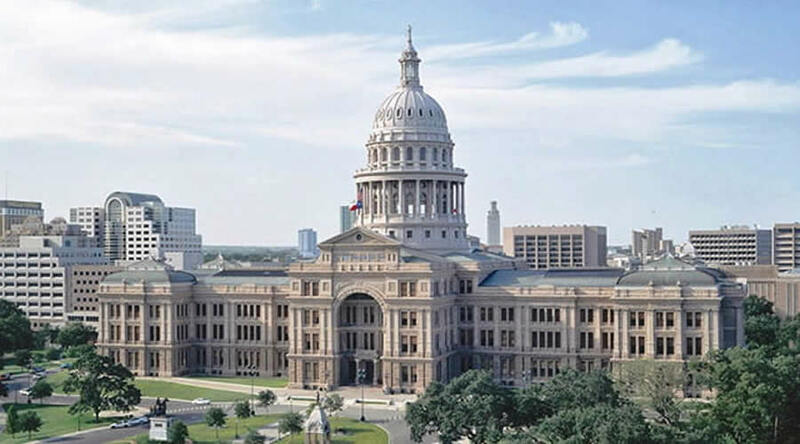 Built of a thick layer of oak laminated over a core of white pine, the doors are hung on the largest of the massive "Texas Capitol" hinges found throughout the building. This year, the SPB conducted a preservation effort on these important historic elements. 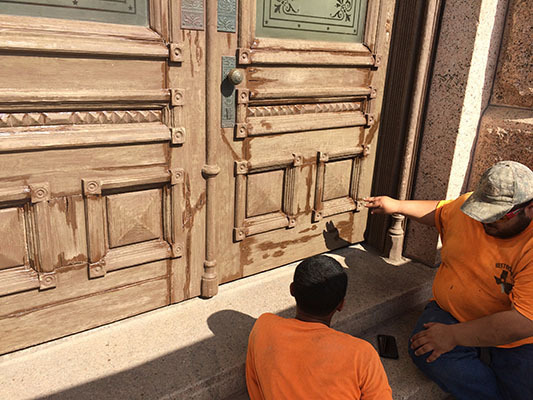 The sensitive treatment included stripping loose paint, patching cracks and nicks, replacing perimeter sealants, and applying a fresh coat of protective paint to the exterior. 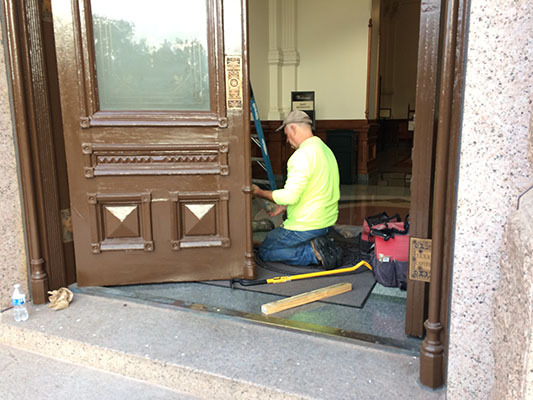 Sweeps were replaced at the bottoms of the doors to keep out air and insects. New closers were installed to make these massive doors as easy as possible to open, while keeping them securely shut to keep out the elements. All historic hardware was restored to smooth function. Attachment points of hardware were reinforced to protect adjacent historic wood, and catches were adjusted to accommodate each door's unique shape without placing them under stress. 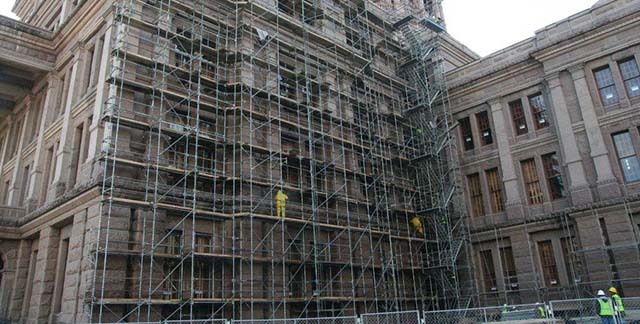 The State Preservation Board (SPB) is currently replacing exterior decks at the Texas Capitol. 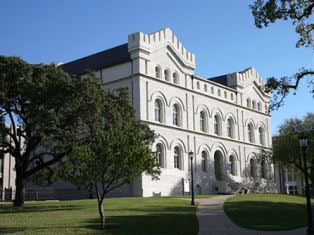 These include the east and west exterior pedestrian entrance decks and the elevated decks at the north porch on the second and fourth floors. 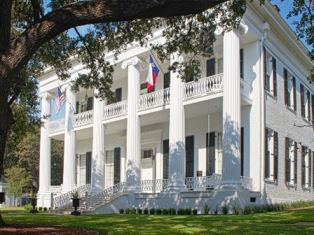 In Elijah E. Myers's original design, the east and west decks were to be covered with porticos similar to the existing north porch. 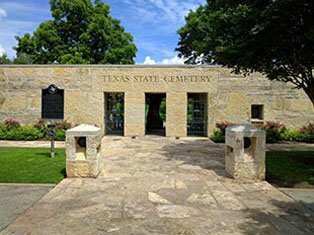 The porticos were removed from the design in 1885 as a cost savings measure when changing the exterior stone from limestone to granite. 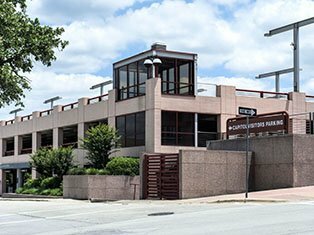 Currently, these decks serve as walking surfaces, but are also effectively roofs over the spaces below. 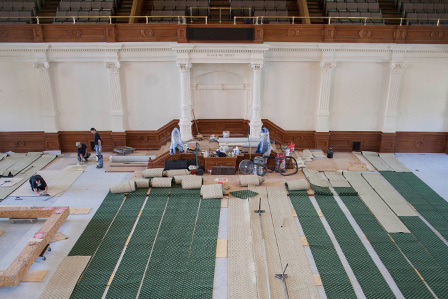 Their waterproofing systems need replacement, 25 years after their installation in the comprehensive Capitol Restoration of the early 1990s. Water carrying damaging salts has been infiltrating through the decks into the structures below. 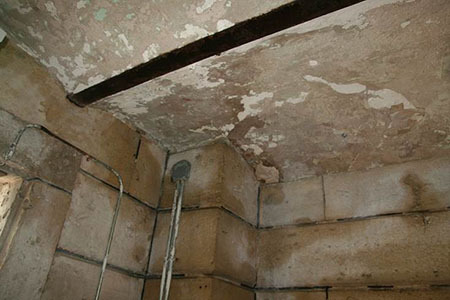 As a result, SPB has observed rusting of important wrought iron structural elements, failure of mortar and plaster in the brick ceiling vaults and erosion of the original historic limestone walls below. 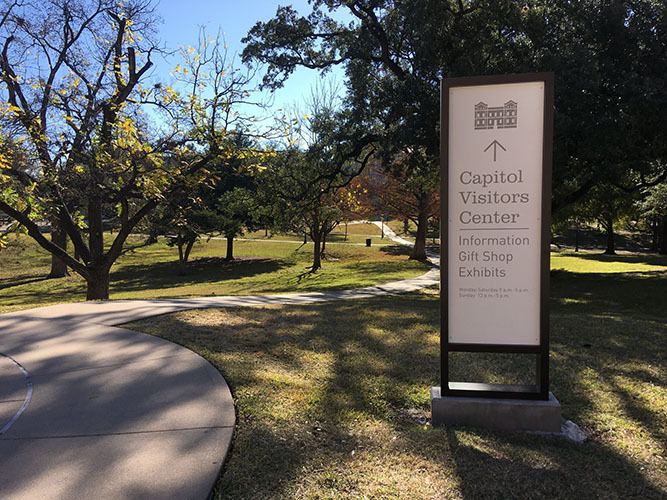 In 2018, the SPB will install a signage upgrade extending from the Visitors Parking Garage, across the Capitol Square grounds, and into the Capitol. 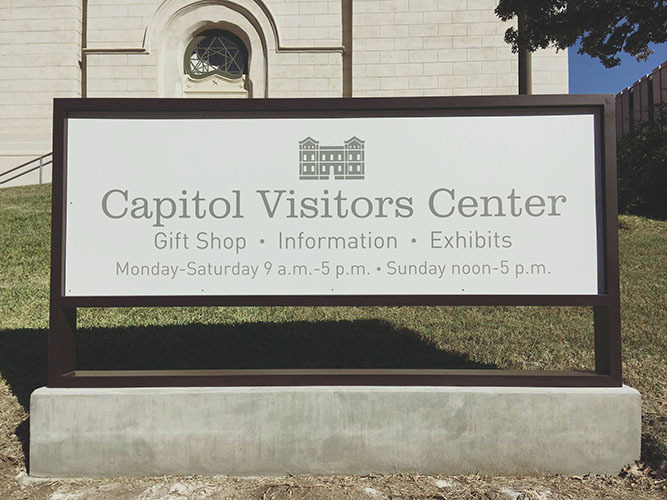 The intent of the signage is to improve the visitor experience with a focus on improved wayfinding for visitors with physical impairments. 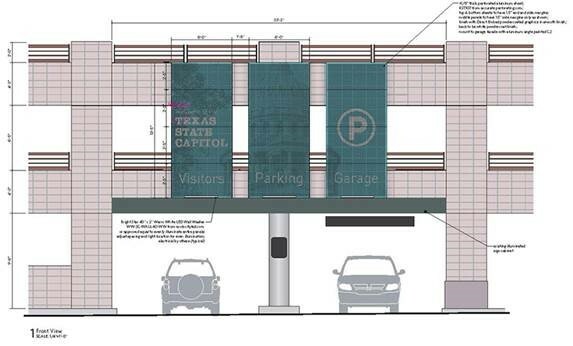 The Garage will have improved directional signage making the facility easier to identify for visitors arriving by car, and wayfinding signage indicating how to move toward the Capitol, once parked. 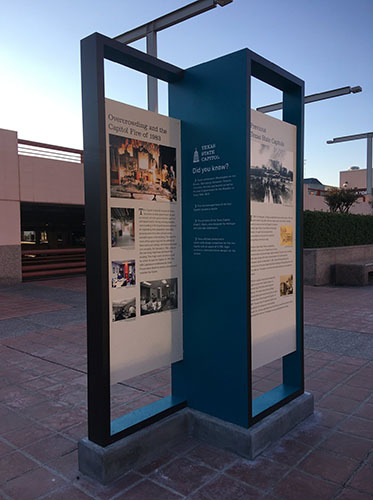 Informational kiosks outside the garage will provide additional wayfinding elements, as well as historical information about the Capitol and Capitol Square. 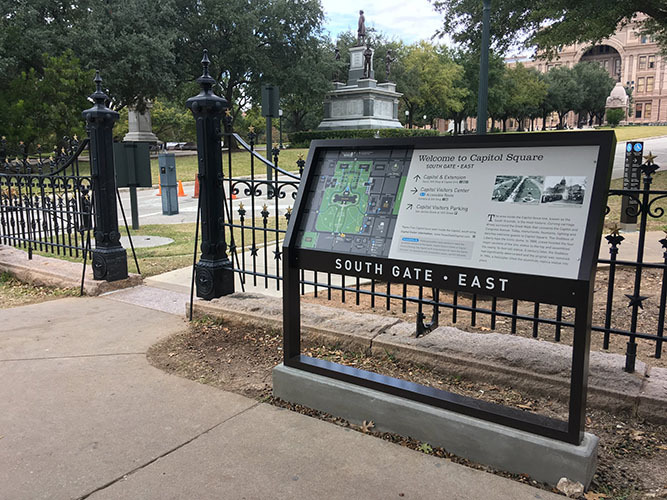 Once on the historic grounds, signage will be minimized to protect the historic landscape. 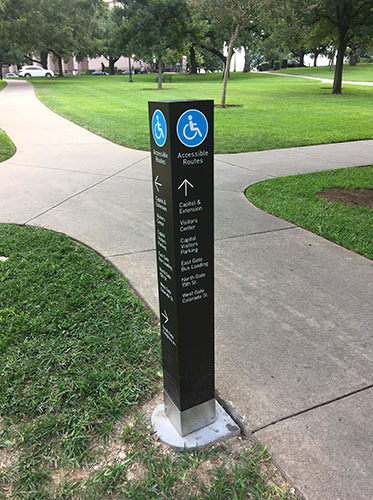 New elements will include maps at each entrance and more frequent wayfinding signage along the sidewalks indicating accessible routes to all destinations across the Grounds. 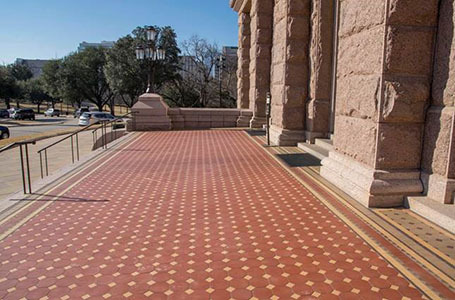 Inside the Capitol, minor detached signage will be added at entrances, elevators and hearing rooms to improve queuing and security screening and encourage priority access for visitors with disabilities. 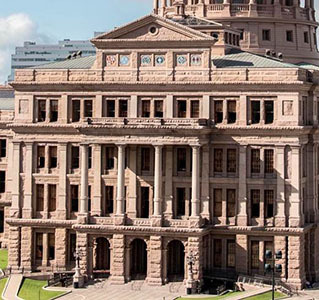 The Capitol's finely crafted windows retain significant elements of their original wood and plate glass. 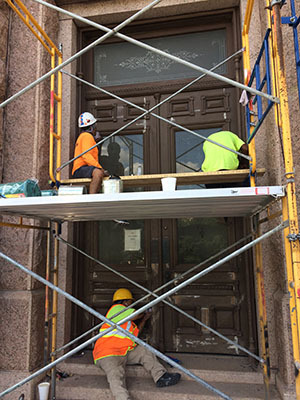 In 2015, the Preservation Board began to repair and stabilize more than 700 frames and windows. 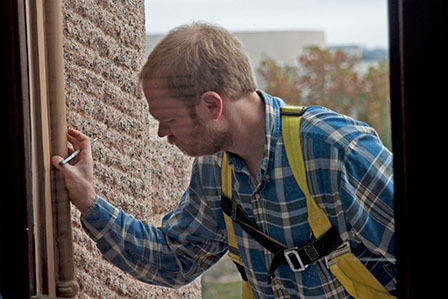 The entire exterior masonry surface will be gently cleaned and thoroughly inspected. Stone will be repaired, and mortar joints repointed as necessary. 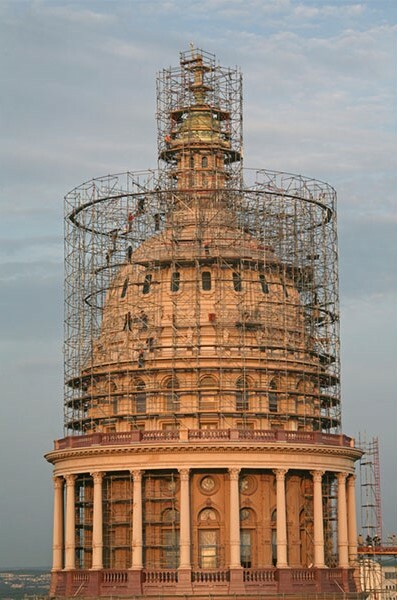 This undertaking requires an elaborate scaffold and multiplatform design to address each of these irreplaceable pieces. 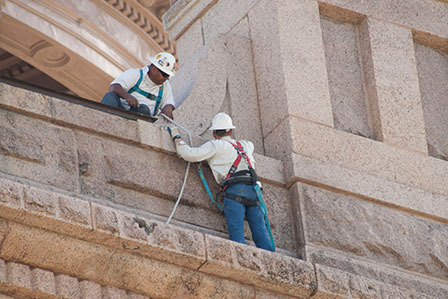 During a inspection of the Capitol's exterior, staff discovered erosion of a mortar joint in the pediment due to water damage. 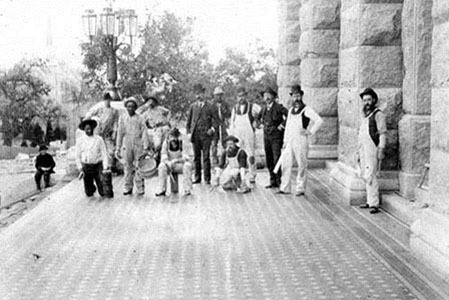 Workers re-pointed the joint using a compatible mix of Portland cement for stability and lime to accommodate movement of stone. Inspections of this and other similar areas of the building take place on a scheduled basis to ensure the stability of the building. 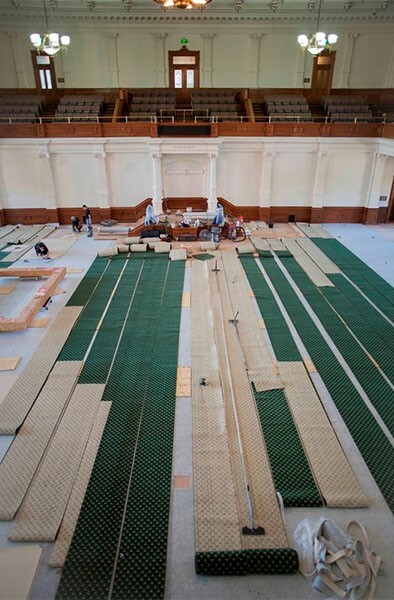 In 2014, a reproduction of the Senate Chamber’s c. 1902 historical wool carpet was loomed and installed to replace the previously well-worn reproduction. Installation including hand sewing together 27 inch strips of carpet. The project did not use tax dollars. 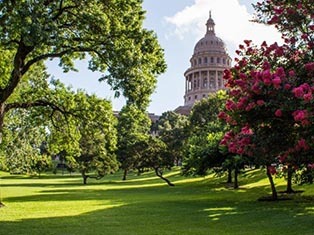 Funds generated from parking revenue, gift shop sales, concessions from the Capitol Grill and lease payments paid for the repairs. 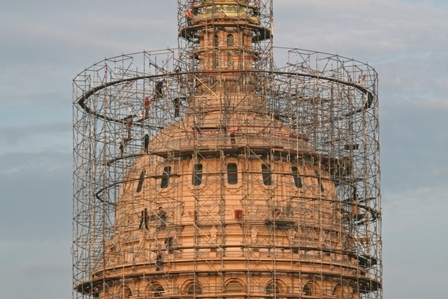 In 2010, scaffolding covered the entire dome and cupolas. 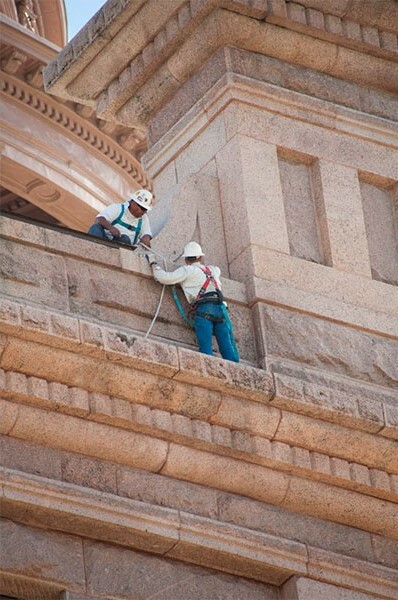 Workers painted the dome to match the color of the Texas Sunset Red granite and undertook substantial water-proofing, asbestos removal and metal refurbishing. The project did not use tax dollars. 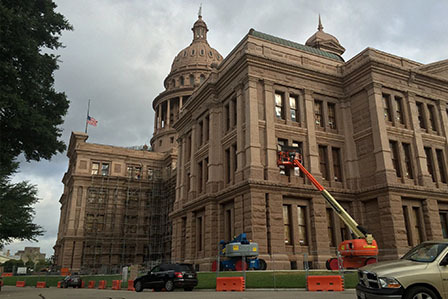 Funds generated from parking revenue, gift shop sales, concessions from the Capitol Grill and lease payments paid for the repairs.